Runners up two years ago in Suzhou, Japan’s Maharu Yoshimura and Kasumi Ishikawa won the Mixed Doubles title at the Liebherr 2017 World Championships in Düsseldorf on the afternoon of Saturday 3rd May. At the final hurdle, the no.6 seeds, they overcame Chinese Taipei’s Chen Chien-An and Cheng I-Ching, the no.5 seeds, to arrest the title (8-11, 8-11, 11-8, 10-12, 11-4, 11-9, 11-5). 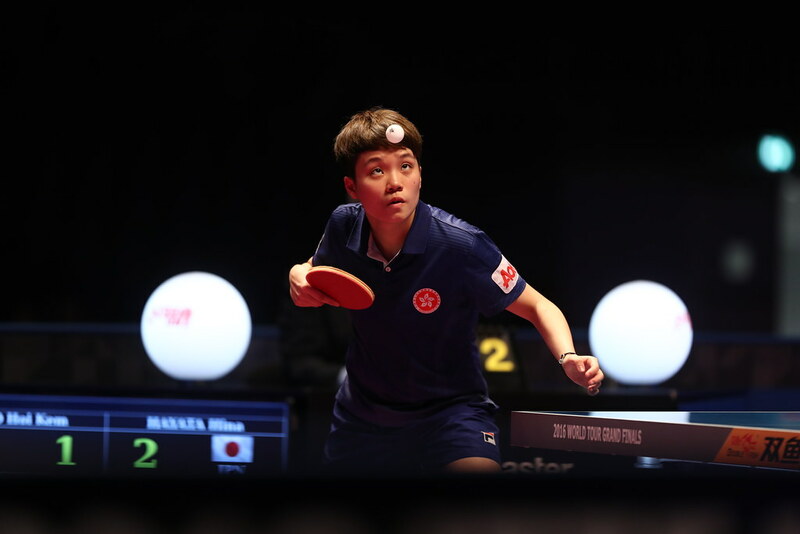 Earlier in the day both pairs had been involved hard fought seven games duels; Chen Chien-An and Cheng I-Ching had beaten Hong Kong’s Wong Chun Ting and Doo Hoi Kem; Maharu Yoshimura and Kasumi Ishikawa had overcome the combination of China’s Fang Bo and the host nation’s Petrissa Solja. The question posed was as to who would respond the better in the final; short rallies, nervous moments, Chen Chien-An and Cheng I-Ching captured the first two games At the crucial moments, the Chinese Taipei responded; nothing extravagant, simply playing consistently and keeping the ball on the table to maintain pressure on their adversaries. In the third game it was the reverse scenario. The success motivated, Maharu Yoshimura and Kasumi Ishikawa; in the fourth game they made the better start but the verdict went in favour of Chen Chien-An and Cheng I-Ching; the Chinese Taipei duo enjoying a major stroke of good fortune. Leading 11-10, Chen Chien-An unleashed a fearsome backhand top spin; the ball clipped the net and then the edge of the table; Kasumi Ishikawa could only stand in dismay. Stung by the misfortune, Maharu Yoshimura and Kasumi Ishikawa dominated the fifth game; a key factor in the match was emerging, if Maharu Yoshimura could release a powerful forehand top spin early in the rally, the verdict went to Japan, conversely if Chen Chien-An could do the same, it was point to Chinese Taipei. The sixth game was as tense as the previous; trailing 6-7, the Japanese camp called “Time Out”. Maharu Yoshimura and Kasumi Ishikawa levelled, eventually securing the game; a deciding seventh game beckoned. A narrow success; in the seventh game, Maharu Yoshimura and Kasumi Ishikawa won the first three points, Chen Chien-An and Cheng I-Ching called “Time Out”. The pairs changed ends with the Japanese pair leading 5-0, a major advantage; the advantage was never relinquished. At 10-3, Maharu Yoshimura and Kasumi Ishikawa held seven match points; at the third attempt they converted. It was for Japan, the eighth time that they have won the Mixed Doubles event at a World Championships; all previous wins being in the period between 1957 in Stockholm and 1969 in Munich.